As a member of the Specialty Coffee Association of America, our craft roasting facility chooses high quality beans. Specialty coffees are “cupped” (brewed coffee is evaluated for taste and aroma) and scored on a grading system similar to that of wine. This scale is recognized throughout the world for scoring coffees. Any coffee scoring fewer than 80 points is not considered a specialty coffee. In addition to being a specialty coffee roaster, McMenamins Coffee Roasters is also a small-batch roaster dedicated to serving the best coffee as fresh as possible. We receive orders from our locations each week, roast the coffee the next day and ship it to all McMenamins. Roasting in small batches allows us to give our full attention to the bean and provide our patrons with the best quality product. Our house-roasted coffees are served at all McMenamins locations and are available for purchase at our Coffee Roaster or online. All of our beans are given special attention by roasting each variety seperately before blending. For a top-quality brew, keep your coffee in a cool, dry cupboard away from heat, moisture and sunlight. Las Isabellas farm is located in the southwestern corner of the country and sits at an altitude of 5,200 ft. The high elevation and the natural canopy of the surrounding forest contribute to the superior quality of the coffee. Diurnal temperatures (variation in temperature) at high altitudes produce wide variations of sugar that later translate to greater flavor. The flavor profile: Fragrant with a full body and bold chocolate. The finish is clean with a subtle hint of cinnamon and berries. McMenamins bought this estate coffee directly from the farm. This purchase continues our commitment to quality as well as fair trade practices. Santa Leticia is offered as a stand-alone origin, and is included in our House and Morning blends. Our Ethiopian natural is a dry-processed coffee. Coffee cherries are harvested and laid out on patios to dry with the fruit left on the seed. The result is a coffee rich in fruit and complexity. Most coffees grown in the province of Sidamo are known for their bright acidity and citrus-like quality. Ethiopia is the birthplace of coffee, and the agricultural methods practiced in producing coffee from this region have been employed for several centuries. In order to draw out the fruit and brightness, we roast this at city. Ethiopian coffees make up one third of our Morning blend, and are offered throughout the company as stand-alone single origins. We pride ourselves at McMenamins for maintaining high standards when it comes to decaf coffee. The process of decaffeination can be harsh and sometimes toxic. Most cheap decaf coffees are chemically altered with the use of ethyl acetate. 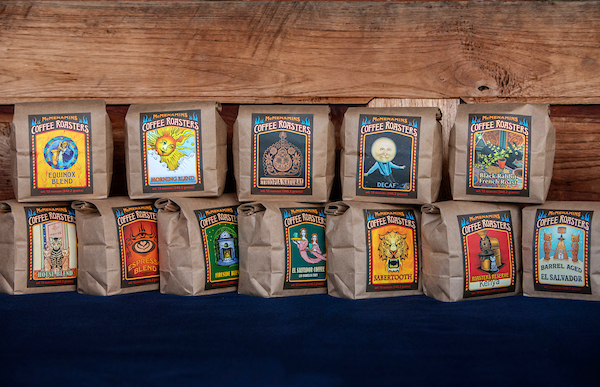 McMenamins Coffee Roasters always purchases water-processed decaf, which is full-bodied and flavorful. In short, water-processed decaf coffee is soaked in tanks, and the caffeine is gradually extracted through the use of high-temperature water. Coffee flavor solids and caffeine pass through a carbon filter. The caffeine is then separated from the solids, and discarded. Seasonal Single origin. This coffee varies throughout the year. We buy fresh crop arrivals from growing regions around the world. They are limited time offers and change often. These coffees will offer great flavors that showcase the coffee region that they are from and we often buy single farm or from unusual locations. KENYA: Kenya is an amazing coffee origin. It is grown at high altitudes of up to 2300 meters giving it the complex flavors that Kenyan coffees are known for. The coffee is rich and aromatic, it has a nice balance of stone fruit and citrus notes and a heavy bodied finish. This coffee is grown by small farms and has a great impact on the local coffee growers. NEW GUINEA: This coffee comes from Southeast Asia and is grown by small family farms. It is known for its heavy body and nice chocolate notes. We use this coffee in many of our blends but it is also excellent as a single origin. This coffee is mild in acidity so it makes for a rich and smooth cup of that is very approachable. COLOMBIA: Colombia is one of the most well known coffee growing regions in the world due to their excellent marketing through the Juan Valdez coffee promotions since the 1950’s. Colombia has two mountain ranges that provide a wide range of coffee profiles and also allows two harvest seasons a year. This coffee is rich and balanced with nice citrus and chocolate notes.